1) To improve the view, remove the threshold plastic cover and the left side front cover. Both pieces simply unsnap with a good stout pull. Remove the threshold first. 2) Unbolt the three 10mm bolts holding down the parking brake mechanism. There is one an upper , a lower and a front bolt. The front is hardest because of limited access and a very short turn radius for the 10 mm open end wrench that is about all that will fit in there. I found it helpful to remove a wiring harness panel fastener to allow the harness to be position out of the way. The other two are fairly easy to remove with a six inch extension bar on 3/8’ ratchet. The upper has to be engaged by feel, though, as it’s up and back in there a bit. 3) Unplug the wiring connector going to the switch. This took a squeezing motion on the opposite sides of the plug with a finger from each hand. 4) Pull the parking brake mechanism downward. This requires some pretty serious jostling and pulling. When it gets low enough to reach the 7mm screw head mounting the switch, remove it with a nut driver. 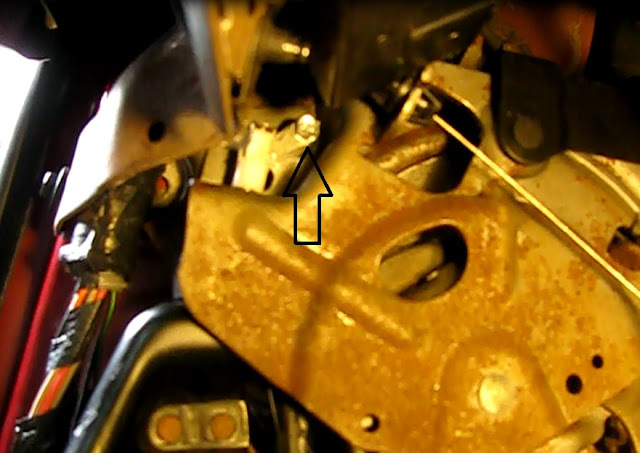 5) The switch is simple and all the working parts can be seen. The spring loaded plunger has a floating washer on one end that makes contact with two strips of metal. One goes to the electrical stab-type tab for the wiring plug and the other to the ground connection provided by the 7 mm screw. In the brake applied position the plunger is out and the washer touches both contacts. The switch closes and the brake light comes on. For it to malfunction in this position the circuit must be open somewhere. When tested out of the truck with an ohmmeter the switch works perfectly every time. There is a problem with the ground connection or the wiring connection or the wire. 1) Clean all contact surfaces of the switch with contact cleaner. 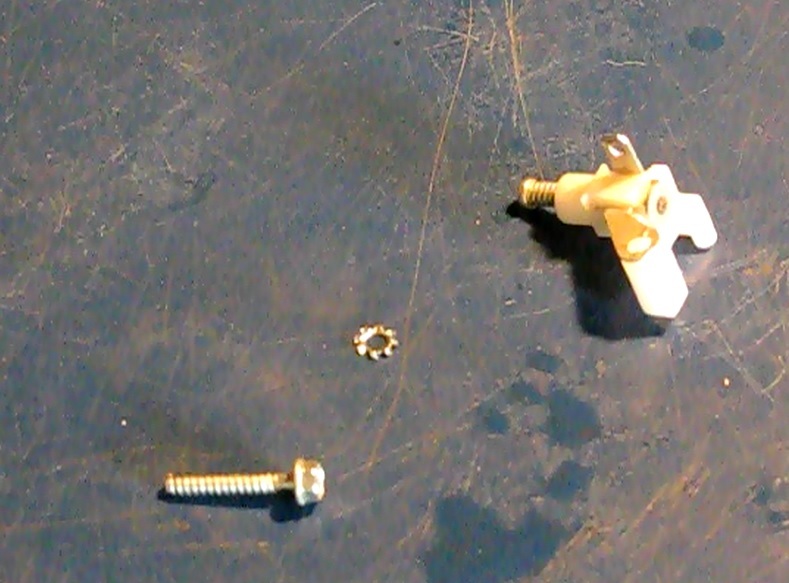 2) Add a lock washer to the switch hold down screw. This will do two things. It will improve the ground connection and also keep the screw from working loose. The addition of a serrated lock wash will fix the likely cause: a poor chassis ground. 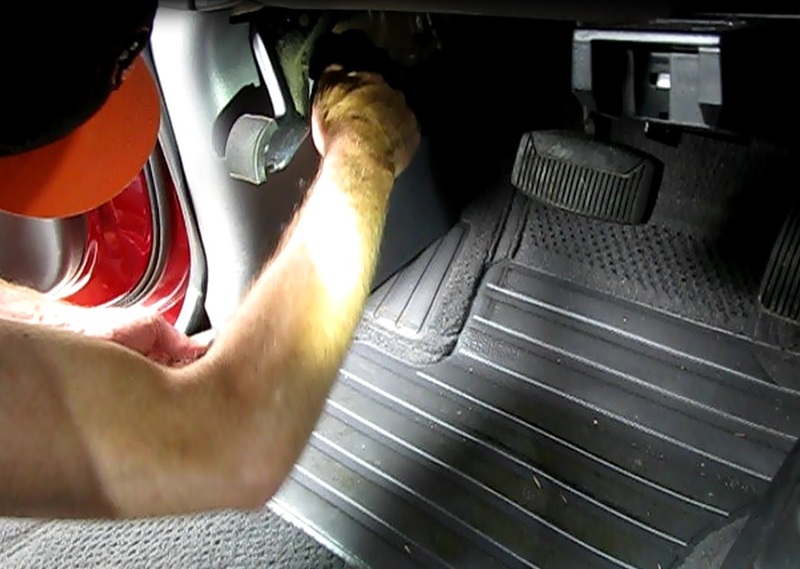 3) Test the repair in the vehicle. Do this before fully finishing all installation work in case there is still a problem. 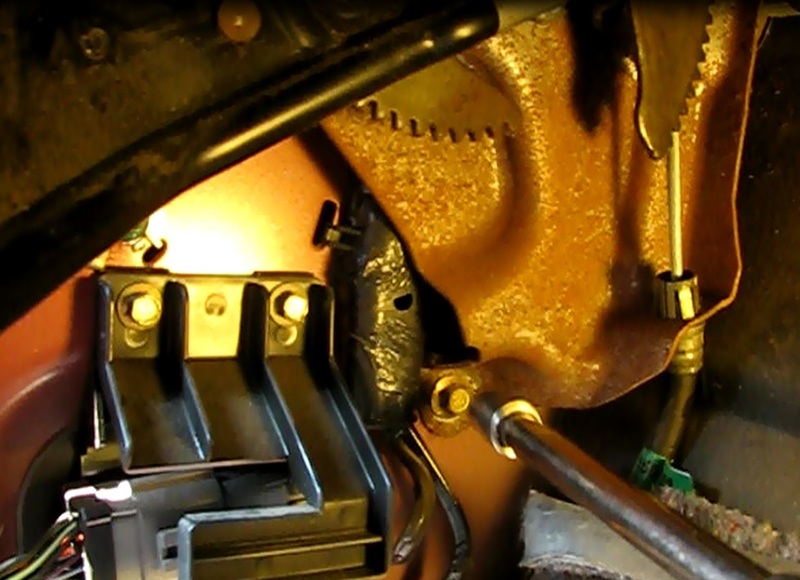 It is necessary to mount the switch first, then move the parking brake assembly back into position and plug in the wiring connector. Securely bolt down one of the mechanism mounting bolts. The lowest one is the easiest. It tested fine. 2) Snap the side cover back in place. Note the plastic projection on a wiring mount that fits into a slot in the back of the cover. 3) Snap the door threshold cover back in place. 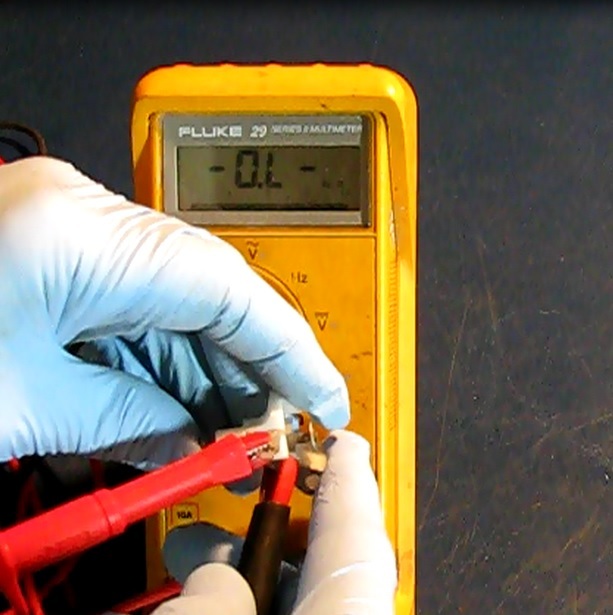 4) Do the final test on the operation of the switch. Make sure it works every time! I’m having a similar parking brake light problem with my 1998 F150. I viewed your video on how to remove the switch by lowering the parking brake assembly low enough to access the switch. I have removed the three bolts and lowered the assembly but I can’t get it low enough to access the 7mm screw that holds the switch in place. It looks like the fuse box is in the way and preventing me from pulling the assembly low enough. How did you get the assembly down low enough to access the switch? I did not remove any other parts to get it low enough. But I will tell you that it is a tight fit and took some pretty extreme jostling to get it jut low enough to reach the bolt for the switch. Now maybe yours is somewhat different than mine but probably not. Good luck and keep at it. I eventually had to remove the fuse box to get access to the 7mm screw that held the switch in place. After removing both and testing the switch, it worked fine after I cleaned it with contact cleaner. I also added a lock washer when I reinstalled the switch. Thanks for your video and blog entry. You're welcome. Looks like we had the exact same problem with the ground connection. Good work. That isn't that easy. Hello David, I just fixed the intermittent parking brake light problem on my 2000 F150 following the procedure on your video, I just wanted to thank you, the procedure worked perfect and the light works all the time now. The only thing I found out is that the top bolt on the parking brake assembly does not need to be completely removed as the assembly is slotted at the top bolt location. Thanks again. You're welcome and thanks for adding the useful comment.